If you've longed to learn to tickle the ivories but can’t commit to piano lessons, Skoove may be just the teacher for you. Skoove, backed by Microsoft Ventures, is a computer browser-based program that can teach you how to play the piano from home (or wherever you find yourself at a computer). Just connect your keyboard or e-piano to your computer via USB, and you'll be on your way. The service, which calls itself "the world's first truly interactive online piano lessons," works similarly to an in-person piano lesson. Skoove listens to you as you play and offers feedback on how you’re doing. You’ll see optimal hand positioning on your computer screen as you practice and will feel free to move at your own pace. Skoove’s low-pressure, “you set the tempo” teaching style aims to make beginners feel comfortable as they progress. Users can even go back and review feedback from previous lessons. 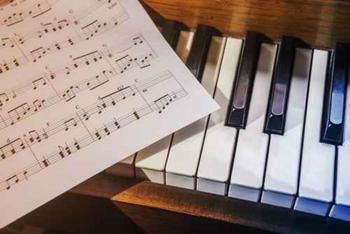 Aspiring pianists can play popular or classic tunes, learn how to read music, and even conquer some music theory. The curriculum was developed by German-board composer Dominik Schirmir and is split into different segments. In some respects, the service might pale in comparison to real piano lessons. You probably won’t, for example, become a concert pianist through online lessons alone. (Skoove is primarily geared toward those at a beginner or intermediate level.) But Skoove could benefit those who want to learn the basics of piano but don’t have the time or money for weekly lessons. After you’ve mastered the free version of Skoove, you can sign up for a premium subscription ($5 to $10 per month). The premium subscription will grant you access to all the songs and lessons in Skoove's piano-teaching arsenal. The service is currently available for PC/Mac only. However, Skoove says to stay “tuned” for the creation of an iOS app in 2016.